The Northwestern Hawaiian Islands or the Leeward Islands are the small islands and atolls in the Hawaiian island chain located northwest (in some cases, far to the northwest) of the islands of Kauai and Niihau. Politically, they are all part of Honolulu County in the U.S. state of Hawaii, except Midway Atoll, which is a territory distinct from Hawaii and grouped as one of the United States Minor Outlying Islands. The United States Census Bureau defines this area, except Midway, as Census Tract 114.98 of Honolulu County. Its total land area is 3.1075 square miles (8.048 km2). All the islands except Nihoa are north of the Tropic of Cancer, making them the only islands in Hawaii that lie outside the tropics. The interior of Laysan, showing the hypersaline lake. 156-acre (0.63 km2) Nihoa is the youngest of the NWHI, and the tallest, with 900-foot (270 m) vertical cliffs. It represents the southwestern part of the island's former volcanic cone. Ancient Hawaiians might have stayed here long-term. 40-acre (160,000 m2) Necker Island is hook shaped and 270 feet (82 m) tall at its summit. Barren of vegetation, it was used by Ancient Hawaiians for religious purposes, but not for long-term habitation. French Frigate Shoals is an atoll, the largest region of coral reefs in Hawaii, at 200 square miles (520 km2). The atoll is composed of a dozen or so small islands, Tern Island housing an airport and human habitations. Gardner Pinnacles is made up of two small basalt peaks, the last rocky island in Hawaii. While the island itself is tiny, the surrounding reef is expansive and diverse. 166-square-mile (430 km2) Maro Reef is an extremely fertile reef system that has been described as a "coral garden". Lisianski Island, only 400 acres (1.6 km2), is geologically akin to Laysan, without the lake. Though the island is slightly less biodiverse, the surrounding reef is very fertile. Pearl and Hermes Atoll is an atoll very similar to French Frigate Shoals, but with much less dry land. For this reason, it was mostly ignored by guano miners and feather hunters. 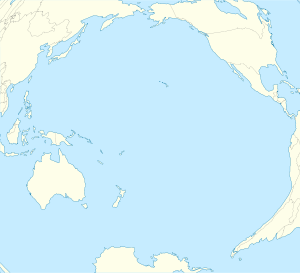 Midway Atoll is the most commonly known of the NWHI, and is also the largest. The Battle of Midway was fought here and in its surrounding waters, and the island remains permanently inhabited, albeit by persons who are there in consequence of their service with the United States Government, not an indigenous population. Circular Kure Atoll contains the 236-acre (0.96 km2) Green Island, which used to host a LORAN station and a runway, but these have since been demolished. In terms of biodiversity, Kure is one of the less impressive of the NWHI. The Northwestern Hawaiian Islands were formed, approximately 7 to 30 million years ago, as shield volcanoes over the same volcanic hotspot that formed the Emperor Seamounts to the north and the Main Hawaiian Islands to the south. As the Pacific Plate moved north and later northwest over the hot spot, volcanic eruptions built up islands in a linear chain. The isolated land masses gradually eroded and subsided, evolving from high islands in the south, much like the Main Islands of Hawaii, to atolls (or seamounts) north of the Darwin Point. Each of the NWHI are in various stages of erosion. Nihoa, Necker, and Gardner Pinnacles are rocky, basalt islands that have not eroded enough to form an atoll, or lack a substantial coral reef. Laysan and Lisianski are low, sandy islands that have been eroded longer. French Frigate Shoals, Pearl and Hermes, Midway, and Kure are atolls. The Hawaiian Islands are about 2,500 miles (4,000 km) from North America and 3,800 miles (6,100 km) from Asia, and it is because of this isolation that the Hawaiian Islands have extraordinary numbers of unique species. Only a species that could fly or swim immense distances could reach the archipelago. But whereas Polynesians, and later, Europeans, have largely altered the ecosystem of the Main Hawaiian islands by introducing alien species, the ecosystems of the NWHI remain, for the most part, intact. The extensive coral reefs found in Papahānaumokuākea are home to over 7,000 marine species. Of the many species that live here, over 1,700 species of organisms are endemic to the Hawaiian Islands (i.e., they are found nowhere else). For this reason, the region has been dubbed "America's Galápagos". Though not subject to nearly as much extinction as the main islands, the Leeward Islands have had their share of abuse. From the late 19th to the early 20th centuries, fishermen, guano miners, and feather hunters killed most of the birds and sea life living in the NWHI. Rabbits were introduced to Laysan and Lisianksi, where they multiplied and devoured most of the vegetation, permanently extinguishing several species. However, most of the damage was reversed, and the islands were restored largely to their pre-exploitation state. Some of the endemic species of the NWHI include the Nihoa and Laysan finch, the Laysan duck (the "rarest native waterfowl in the United States"),  and the Nihoa fan palm. Other notable species are the Laysan albatross, the highly endangered Hawaiian monk seal, and the green sea turtle. The only native trapdoor spiders in the Hawaiian archipelago (Nihoa spp. ), recently discovered, are found only here. Most endemic species are highly vulnerable to extinction as one major catastrophic event could wipe out all of the vegetation on each small island. Additionally, seventy percent of all coral reefs in the United States are found here. It is known that the Ancient Hawaiians ventured from the main islands as far as Mokumanamana (Necker), but they might have gone further to French Frigate Shoals. However, they must have been gone by the 18th century, when Europeans discovered the islands, because the islands were deserted upon discovery. Many agricultural terraces have been found on Nihoa, proving that Hawaiians lived there long-term, but Mokumanamana, much barer of vegetation, was probably not able to support many people for long. It is thought that the early Hawaiians only came to Mokumanamana for religious purposes. The first of the Leeward Isles to be discovered by Europeans was Nihoa. James Colnett discovered it in 1786, although historically the credit has gone to William Douglas. Later that year, La Pérouse discovered Necker, and named it for Jacques Necker, the French Minister of Finance. La Pérouse then went on to discover French Frigate Shoals. 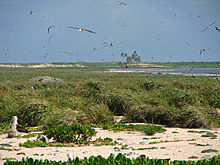 The last of the NWHI to be discovered was Midway Atoll, which was found by N.C. Middlebrooks in 1859. In 1925, the Tanager Expedition travelled to many of the NWHI. The islands were mapped, new species were discovered and described, and the archeological sites on Nihoa and Necker were found. Most of the islands have two names; one in English and one in Hawaiian (indicated in parentheses above). The majority of the Hawaiian names used as alternative to the English ones were created in modern times, the original names that ancient Hawaiians gave to all of these islands that they encountered prior to Western contact are found in various oli (chants) and moʻolelo (stories). On June 15, 2006, American President George W. Bush issued a public proclamation creating Papahānaumokuākea Marine National Monument under the Antiquities Act of 1906. The Monument encompasses the islands and surrounding waters, forming the largest marine wildlife reserve in the world. President Theodore Roosevelt had declared the Northwestern Hawaiian chain a bird sanctuary in 1909 and the islands had been protected since 2000 with a designation as an 'ecosystem reserve' by President Bill Clinton, but increasing it to national monument status provides unprecedented control. 139,000 square miles (360,000 km2) of ocean was at that time set aside for protection, about the size of the U.S. state of California. Entry to the Monument is limited through a permit system, jointly administered by the state of Hawaii, NOAA, and FWS. Anyone who comes to the islands must follow stringent procedures designed to prevent any stray species from entering and disrupting the ecosystem. All clothes must be bought new, and kept wrapped until before arrival. In fact, all "soft" items (camera strap, blanket) must be bought new, and all "hard" items (camera, binoculars) must be cleaned thoroughly. Then, every item must be frozen for 48 hours. A new set of equipment must be prepared for each island one is going to, to prevent inter-island species introduction. However, French Frigate Shoals and Midway Atoll are exempted from these rules, as they are deemed too altered by humans already to worry about introducing new species. ^ Clague, D. A. and Dalrymple, G. B. (1989) Tectonics, geochronology, and origin of the Hawaiian-Emperor Chain in Winterer, E. L. et al. (editors) (1989) The Eastern Pacific Ocean and Hawaii, Boulder, Geological Society of America. ^ "Papahānaumokuākea Marine National Monument". official web site, National Oceanic and Atmospheric Administration. Retrieved 2009-07-28. ^ FWS (2009). "Laysan Duck - Midway Atoll National Wildlife Refuge". U.S. Fish & Wildlife Service. ^ Eagle, Nathan (August 26, 2016). "Obama To Create World's Largest Protected Marine Area Off Hawaii". Retrieved August 26, 2016. ^ "Fact Sheet: President Obama to Create the World's Largest Marine Protected Area". whitehouse.gov. August 26, 2016. Retrieved September 3, 2016. Census Tract 114.98 and Block 1001 (Necker Island), Honolulu County, Hawaii, United States Census Bureau. Rauzon, M. (2001). "Isles of Refuge: Wildlife and History of the Northwestern Hawaiian Islands". University of Hawaii Press. .
Wikimedia Commons has media related to Northwestern Hawaiian Islands.